Hi there. Moderate Projects user over the years with a scheduling need I've never encountered and I'm hoping I'm just ignorant of an easy solution. I'm currently using a very old 2002 version. Attached is an image with three figures (all different screen shots from a simple 'project' created just to illustrate my issue). This sample project has 3 floating activities and a 'project completion' milestone which has an artificial hard completion date. The behavior of Activity #2 is what I'm attempting to control (I want the float gone). All relationships are simple 'FS' with zero lag. Activities 1 and 3 are constrained 'ASAP' in all three figures. In figure 1, Activity 2 is constrained 'ASAP' with the expected float reflecting the difference in duration between activities 1 and 2. 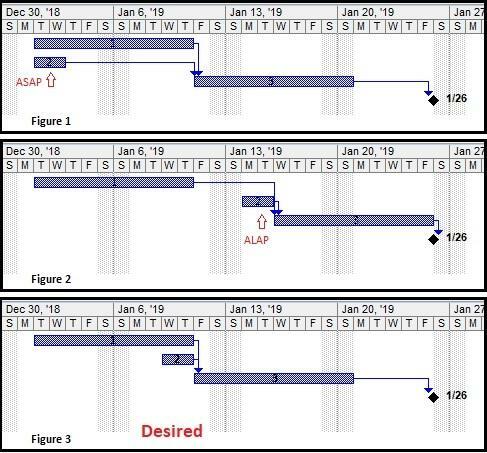 In figure 2, Activity 2 is constrained 'ALAP' which has taken the float out of Activity 2, but pushed Activity 3 down to the project end and the float is now reflected in the start of Activity 3. Figure 3 is what I'm trying to achieve (without a hard constraint). I want the float gone between activities 2 and 3, but I can't have 3 pushed down to the end of the project. In other words, I want Activity 2 to be ALAP while Activity 3 is ASAP. This may sound like a directly conflicting requirement (and it may be as related to Projects' capabilities), but it's not conflicting if one thinks of activity 3 being ALAP relative to Activity 3 while Activity 3 is ASAP relative to the project as a whole. Can this be done in Projects 2002? Any version of Projects? Any version of a CPM software? Remember, it's the described principle I'm interested in -- it would be easy in this little snippet to just 'hard constrain' and get away with it, but I'm involved in a relatively large scheduling project and in such any hard constraints will really create issues as things are updated. 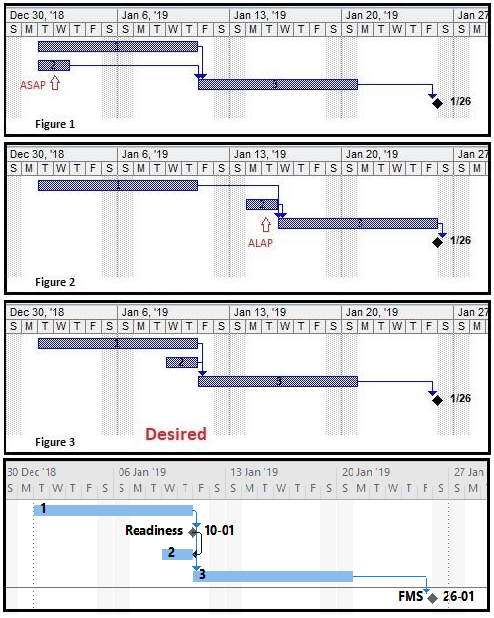 If your only objective is to manipulate the dates to get what you want, then the reverse logic and SF link may be OK; it seems common enough among MSP users of all experience levels. It is nonetheless a misguided approach in logic driven planning, in my opinion. Equipment must be delivered before it is installed - full stop. To discard this requirement and insert the SF link as you suggest is to damage the proper logic flow through the schedule. As a result, the late dates and Slack of activity 2 (delivery) and its predecessors (e.g. specification, PO, design, production, etc.) are incorrect. Moreover, the correct scheduling (early dates) of activity 3 (installation) and its successors is not assured in case of a delay of the equipment. This is the best workaround in MSP, whatever the version you are using . Not and get the desired result - I dont' want Activity 2 to be scheduled to finish with Activity 1, I want its finish to be tied directly to the start of Activity 2 with no float ever. As Tom has accurately described it, it's a 'just in time' scheduling issue. Tom's Macro has worked marvelously btw. Wouldn't it be possible, to simply run Activity 2 with a relation type FF to Activity 1? Thanks for the comment, though I would disagree with your characterization of MSP as a "poor and amateur application." I would say it's a reasonable scheduling application with some pluses and minuses - primarily aimed at a "poor and amateur", but extremely large, user base. These tips are really important, not only to be a workaround for MS limitations, but also to make visible that many schedules are condemned by MS, because since 1998 they ignore ALAP avtivities.why insisting in such a poor and amateur appliction, instead of P6, spider project , or even ASTA power project? Tks. Sorry I didn't think to mention that macro, which I don't use much. Maybe I would use it more if it were improved by combining it with a longest-path-type backward logic tracer. As it is, I've become less reliant on ZFF constraints over the years - in both MSP and OPV - so it's not worth the time to improve the macro. Much appreciated Tom. Your idea was a great workaround and in many instances worked great in my schedule. I had a few places where there were predecessors to the Activity 2 you helped me with and those predecessors had the same issue but without the same solution available. Thanks SO MUCH Tom. I'll give that a try in my full schedule and report back. The behavior you seek is that of a Zero-Free-Float constraint, which is not available in MSP. When used in a forward-scheduled project, the ALAP constraint in MSP is in fact a Zero-Total-Float constraint, which serves no useful purpose as you have found. Though my memory is a bit fuzzy on the earlier versions (and I skipped from Project '98 to Project 2003), I'm pretty sure MSP has never had a ZFF constraint. The workaround, at least where Task 2 represents a just-in-time delivery, is to insert a readiness milestone between 1 and 3. Then make that milestone an FF predecessor of 2. This keeps the logic flow intact without using the C-word. Zero-Free-Float constraints are certainly available in other scheduling software - P3 actually called it by that name. P6 calls it ALAP, which of course causes much confusion for P6 user who stumbles into MSP. I think Asta Power Project allows entire strings of activities to be similarly delayed within available free float - pretty flexible.